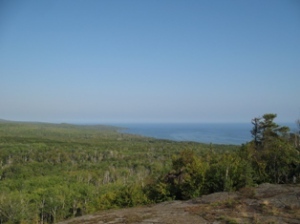 The next time you are in Grand Marais, MN take the hike to the lookout on Pincushion Mountain. This is a perfect afternoon or evening hike. From the Pincushion Lookout you will have views over Lake Superior, the Devil Track River and the town of Grand Marais. The Pincushion Lookout trail is part of the Pincushion Mountain Trail System that includes 25km of trails. The Pincushion trail also connects with the Superior Hiking Trail. From Grand Marais, MN turn west onto the Gunflint Trail for 3 miles and look for the signs for Pincushion Mountain on the right. Park in the parking lot. The trail starts next to the trailhead sign.